The Associated Press is reporting the Hartley Violin sold for $1.6 million today at the auction held by Henry Aldridge & Son. The amount sold sets a record for a Titanic artifact. The name of the buyer, who bid over the phone, wished to remain anonymous according to Andrew Aldridge. Sarah Griffiths, writing for the UK Daily Mail, examines the history of the Hartley violin and the scientific tests taken to determine its authenticity. The various tests–a CT scan, forensic testing of the metal plate, examination of the wood–along with documentary evidence leads to the conclusion the violin is authentic. Additionally corrosion tests match submersion in seawater. Although the violin was not listed in his personal effects when his body was recovered, it is believed that it was regarded as luggage rather than a personal effect. 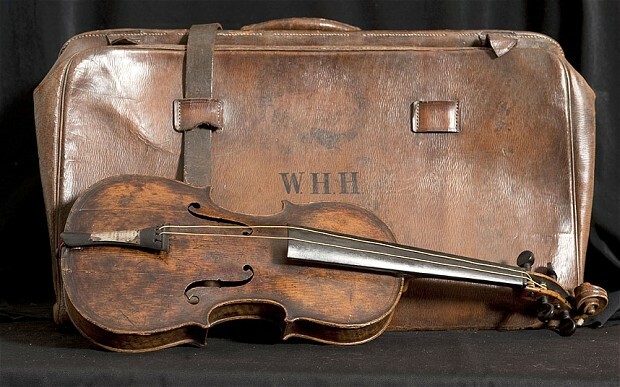 Henry Aldridge & Son claims it invested thousands in getting the violin authenticated. And when it goes on the auction block on 19 Oct, they expect to make it all back (and quite a bit more as well). The violin will likely set a new record if it sells for the estimated £4000,000. I suspect it will sell for a lot more than that. 1. Hartley Violin Update: The Hartley Violin will be going on display next in Belfast in the replica second class accommodation suite from 18 Sept – 13 Oct 2013. It is scheduled to be auctioned by Henry Aldridge & Son later in October. 2. Titanic Exhibition Extended:The Grand Rapids Public Museum has extended again Titanic:The Artifact Exhibition one more week until Saturday, 14 Sep 2013. 3. You cannot make this up. According to This is Lincolnshire, RNLI lifeboat volunteers responded to a report three inflatable tender boats were in trouble. The found one of the boats was named Titanic and its occupants were trying to start the engine. After that failed, the group then attempted to tow the boat back to the beach as RNLI volunteers watched. The Hartley Violin scheduled to end its exhibition at Titanic Branson on 15 Aug has been extended to 7 Sep 2013. According to KMOX news, 18,000 people have seen the violin already. Reservations are required for the daily VIP tour at 8:30 a.m. Further information can be found at titanicbranson.com. Steven Turner, author of The Band That Played On about Titanic musicians, offers his own views about the Hartley violin. He is thrilled the violin has been authenticated and adds some details to the story. First, there was a replica violin made in 1912 by a Hartley friend. That violin disappeared for decades but was donated anonymously in 1974 to Youth Orchestra in Colne, Hartley’s old hometown. He believes the draft letter in Maria Robinson’s diary is authentic. The draft letter thanks Nova Scotia officials for giving her the violin. However there is no record whether it was actually sent or not. However he says the people mentioned in the diary “could all be traced to actual people living at the time.” With the violin authenticated, he thinks the adventures of the violin are not over yet. Of course there still is one or two small problems that have not been resolved. First, why is there no record of Hartley’s violin being found strapped to his chest? Aldridge claims they did not inspect luggage but how could you miss it if strapped to his chest. Second, if indeed found on or near Hartley’s body, why is their no record anywhere of it being found or inspected?These nagging questions ought to be resolved.